Yesterday was Joanna's birthday and like most people I bake for she asked for something chocolate and bite-sized. So I started thinking about what to make and I originally thought I'd make a domino-cookie -- chocolate-cookie with white chocolate chips, but that didn't seem right. Definitely not chocolaty enough. And then I came across a chocolate-chocolate chip cookie with mocha cream filling on Epicurious. Since I remembered seeing Joanna with a big cup of Starbuck's at her desk, I knew I'd found a winner. So, I tweaked the recipe a bit (a little on purpose, a little on accident) and a star was born! Everyone loved them. I'll definitely make these again. Stir chocolate chips, cream, and coffee granules in heavy saucepan over medium heat until chocolate melts and coffee dissolves. Cool to room temperature, about 20 minutes. Using electric mixer, beat sugar, butter, and vanilla in bowl until blended. Beat in chocolate mixture. Refrigerate until beginning to firm, about 20 minutes. Preheat oven to 325F. Line 2 baking sheets with parchment paper. Sift flour, cocoa, baking soda, and salt into bowl. Using electric mixer, beat butter and both sugars in bowl until well blended. Add egg, 4 teaspoons water, vanilla, and instant coffee; blend well. Beat in flour mixture. Stir in chocolate chips and chopped chocolate. 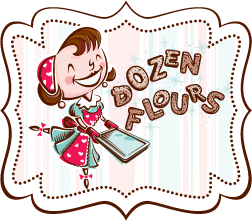 Drop dough by tablespoonfuls onto prepared sheets, spacing 2 inches apart. Bake until tops are just firm to touch and no longer shiny, about 10 minutes. 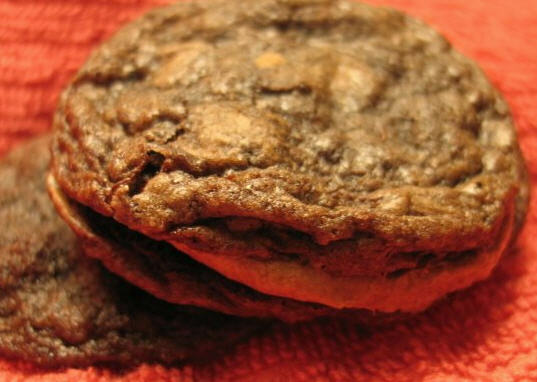 Cool cookies on sheets 10 minutes. Transfer to racks and cool. Once the cookies are room temperature, place cookies flat side up on work surface. Spread each with 1 tablespoon of buttercream leaving 1/4-inch border. Top each with second cookie, pressing to adhere. Cover and chill at least 2 hours. (Can be made 2 days ahead. Keep chilled.) Cookies are best served cold. These are a big deal. No disrespect to any of their cookie predecessors, but THESE. These are the cookies I'm never going to forget. 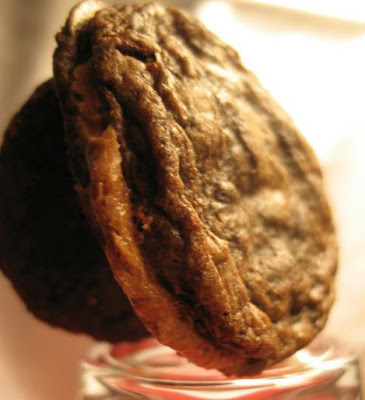 Mocha creme oozing out from between two perfectly thin and wrinkly chocolate cookies? Mark my words, I will eat these again.